Home > Organizing Tips > Closet > Closet Organization Q+A: How do you live with small closets? 1. Utilize the full height of your closet. How much space is between the top shelf of your closet and the closet ceiling? If it’s greater than four feet, you might make better use of your space by adding another shelf above the existing top shelf. Use your new top shelf to store out of season or infrequently used items. Not only will you have more storage space, you’ll also have easier access to items on your lower shelf. (Don’t you hate it when the sweater you want to wear is on the bottom of a stack of ten sweaters?) Consider buying a top shelf narrower than the existing shelf, to make it easy to see and access items on both shelves. If you’ve moved your shoes off the floor, you now have a full length closet to use. Take stock of your wardrobe. 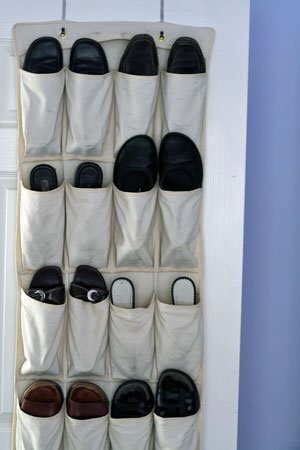 Do you have a lot of full length hanging items, or is there precious, unused space between your clothes and the floor? To better utilize the full length of your closet, consider adding a second hanging rod. Or purchase canvas sweater hangers. In the space where you could hang between 6 to 8 sweaters or T-shirts on hangers, you can fold between 16 to 24 in a canvas, hanging shelf. What a great use of space! 3. Move out of season clothing into deep storage. Use space in a guest bedroom, your kids’ rooms, the attic or basement. There are many portable wardrobes on the market today to keep items covered and hung up, out of your bedroom closet. 4. Avoid taking up precious closet space with a dirty clothes basket or hamper. Consider moving your hamper into the bathroom. Another option is to purchase an attractive wicker hamper that complements the decor of your bedroom. Only FOUR are listed here. How do we get the fifth? Thanks, Jean for pointing this out! We moved some content around on our site…and lost track of our tip count on this page! I will get that updated. And I also have an instant download guide for sale that gives a complete process for organizing your closet and overcoming common obstacles.